Tokens of the Past: Yuletide Greetings pattern...coming soon! 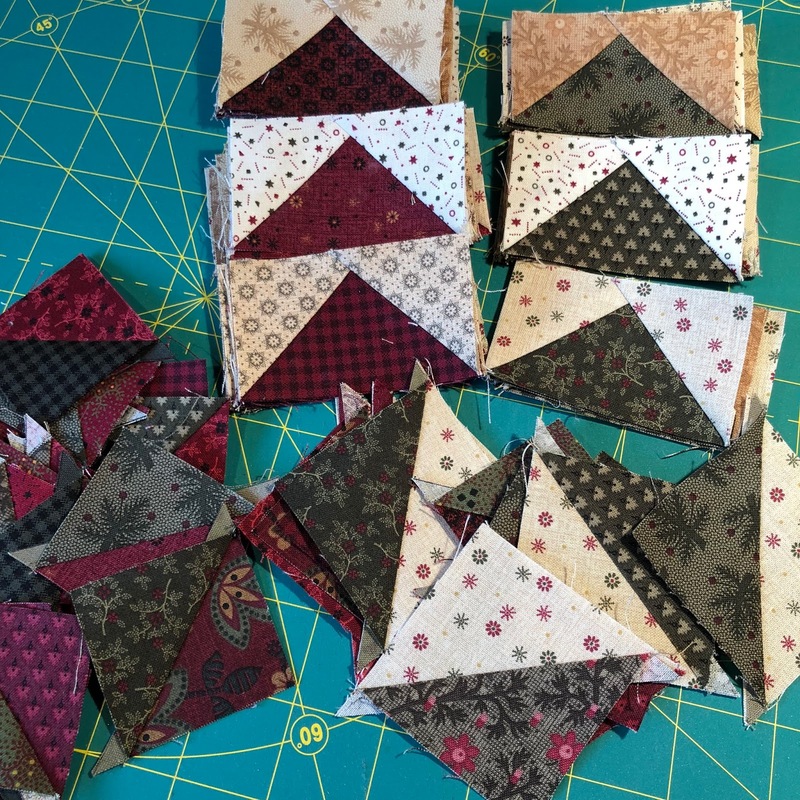 10 inch precut plus yardage for borders, binding and such. Can't wait to share the quilts designs with you.....soon. It shouldn't be too long....I hope...I think. In the meantime, I'm about to pack boxes and suitcases to do some traveling. First up is a visit to Cape Cod....be till my heart! I love Cape Cod and am very anxious to return. My hubby and I will be visiting Boston, too, and then home for a month. I will be visiting the Bayberry Quilter Guild of Cape Cod March 27th thru 29th. Lecture and workshops will be at Our Lady of the Cape Church, Brewster, MA. I'd love to see you if you're in the Cape Cod area. 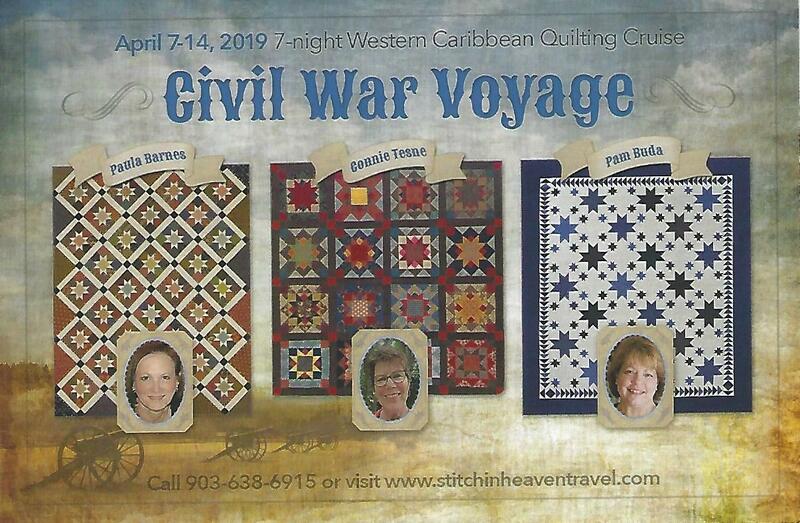 In April, I'll be boarding the Liberty of the Seas to teach on a Carribbean quilting cruise along with fellow designers and friends Julie Hendricksen of JJ Stitches and Carol Hopkins of Carol Hopkins Designs!! What fun!! Looking forward to the warm weather and sunshine. If you missed out on going on this years cruise, fear not! I have been invited to return for a 2019 cruise with fellow Marcus Fabrics quilt designer and friend, Paula Barnes of Red Crinoline Quilts and Connie Tesene of Country Threads! Wow! Another awesome line-up. Cruise dates are April 7 thru 14th cruising to Galveston, Jamaica, Grand Cayman and Cozumel. Think about it...what fun, good food, great destinations and 3 wonderful quilts all await you! Later this year, I'll be giving lectures and workshops in Georgia, Illinois, Missouri and Tennessee. I'll post more news on these trips as time grows closer. Back to secret sewing. Oh...and I'm still quite diligent spending one hour early in the morning on my super secret scrappy project! I'm 1/3 of the way there! Progress feels so good. Oh, if only I could come on a cruise with you all!! One day!!! I was on Facebook the other day and came across this picture of a group of quilts and thought "This would be perfect in Pam Buda fabrics!". Then I looked at the caption and it was a photo by American Patchwork and Quilting and it was your quilt...I wasn't surprised when I read that LOL. The quilt that I liked was one on the left...nine patch with the four inside squares (not the X) in medium coloured fabrics. How fun to be able to play in those lovely fabrics. Looking forward to the reveal of the three quilts in Yuletide Greetings! So gorgeous fabrics and wishing you a lot of fun in your travels. You sure do a lot of secret sewing! Can't wait to see what these become!